To help celebrate their centenary year, Hollingbury Park Bowls Club invited The Royal Hospital Chelsea Bowls Club to play a game of lawn bowls at their ground at Ditchling Road. 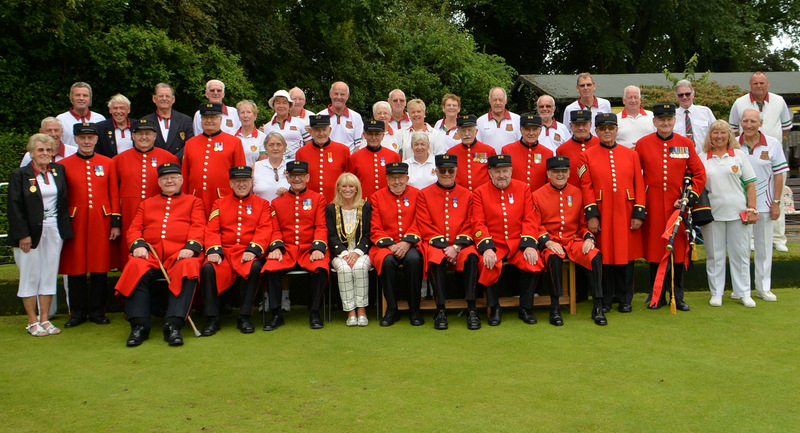 On Wednesday 15th August they welcomed nineteen Chelsea Pensioners and their resident piper. The event was also attended by the Mayor of Brighton and Hove, Councillor Dee Simson. Before the game could start the format of play was agreed and sorted. Several Hollingbury players were ‘loaned’ to the opposition and a total of five ‘rinks’ consisting 8 players each played 18 ends. The result was a win to the Chelsea Pensioners by 73 to 65. The weather was very kind, warm, some sun, just a light breeze, a perfect afternoon for a competitive game of bowls. As part of their centenary celebrations, Hollingbury Park Bowls Club is planning to demolish the 50-year-old clubhouse and build a larger one which can be used all year round, and will be available for community events. Grant applications have been submitted to Veolia and Sports England for approximately 85% of the cost with the members providing the remaining 15%.